What happens when America's first motorcycle company, Indian Motorcycle teams up with America's first registered distillery Jack Daniel’s? A rowdy whiskey-filled night in a shady bike shed? Well, no. Instead, we get the Indian Scout Bobber Jack Daniel’s limited edition motorcycle. 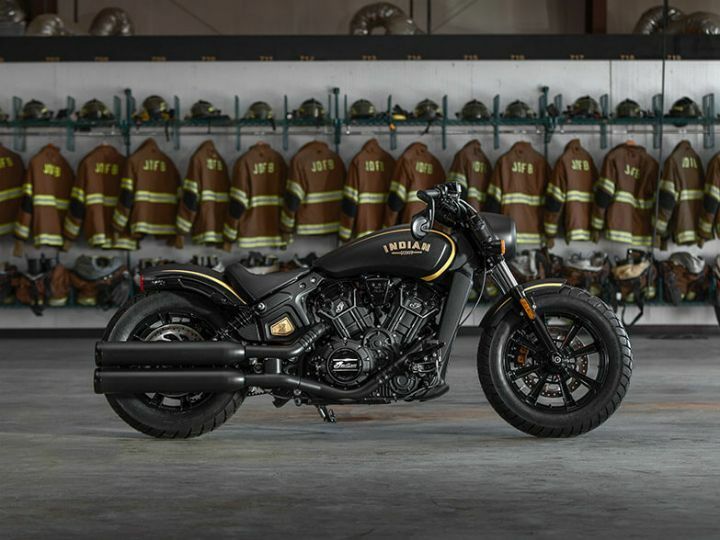 Designed in collaboration with Klock Werks Kustom Cycles, the Indian Scout Bobber limited edition pays homage to Jack Daniel’s’ Fire Brigade, their fire trucks that sport the same gold and black colour scheme as seen on the motorcycle. Yes, they have their own fire brigade which isn’t surprising when you consider that there is over a thousand litres of flammable booze a stone's throw away. The two previously collaborated to bring us the 2016 Springfield Jack Daniel’s Edition and the 2017 Chieftain Jack Daniel's Edition, both of which were sold out within 8 hours of their launch! We can expect a similar outcome this time as well, as only 177 units of the motorcycle are available internationally. Each of the bikes will sport a one-of-a-kind Montana Silversmith badge, which will be numbered individually with 24-carat gold. This black and gold premium combination can also be seen on the fender struts, hand control levers, engine valve covers and even the exhaust tips. Other noteworthy features include chopped fenders, bar-end mirrors, vented exhaust shields, knobby tyres and a slim headlight. Powering the motorcycle is the same liquid-cooled, 60-degree, 1133cc V-Twin engine, which comes with gold-on-black embellishments on the outside. Mated to a 6-speed gearbox, it delivers 95.3PS of power and 97Nm of torque to the rear wheel via a belt drive. Sounds expensive, right? As mentioned earlier, only 177 units of the limited edition bike will be available globally, with each one retailing for $16,999 (around Rs 11 lakh). Currently the standard Indian Scout Bobber retails for Rs 11.99 lakh (ex-showroom). Indian hasn't revealed any details regarding its India launch, but we expect it to happen in the upcoming weeks. Fancy owning a part of America's history? Better start saying yes to all those credit card applications.